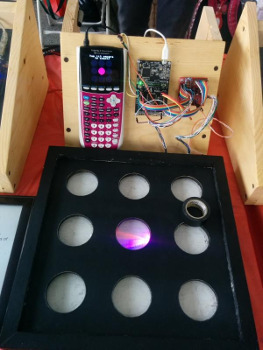 For World Maker Faire 2015, we (Cemetech staff Christopher "Kerm Martian" Mitchell and Tim "geekboy1011" Keller) wanted to create a fun demo that would show what you could do with embedded electronics, a graphing calculator, and the ArTICL library for linking graphing calculators with embedded development boards. We created a light-based Whack-a-Mole game around an MSP432 Launchpad and a TI-84 Plus C Silver Edition. In traditional Whack-a-Mole games, motorized moles pop out of holes in a grid, and you must quickly whack the correct one on the head. In our game, the "moles" are RGB LEDs shining across holes onto CDS cell light sensors, and to "whack" them, you interrupt the light beam. You get 3 lives per game, and whacking the wrong mole or taking too long to whack a mole makes you lose a life. Hit a mole quickly, on the other hand, and get extra points. The game was a popular hit at World Maker Faire 2015 with the younger visitors who enjoyed it for its entertainment value, and the older visitors who understood the engineering behind it. At long last, we have written up the project, walking through the process of designing the game, creating and fabricating the electronics and physical components, and writing the MSP432 firmware and TI-84 Plus C Silver Edition software. Our build log also includes photos and a video of the finished product. If you want to make a version of this Whack-a-Mole game yourself, the code is on GitHub, and the schematics and board layout are in the build log. Have you made your own cool projects connecting graphing calculators with Arduinos or MSP432 Launchpads using ArTICL? If so, we hope you'll share them with us here on Cemetech! Wow!!!!! Just wow!!! I can't believe a z80 based color calc can do this!! This must be some sort of super-efficient asm magic! The science community will assuredly take this as a lesson on how to properly use a ti84+cse or any other calc!!! NICE WORK Kerm!!!! To bad there aren't any school science fairs here in serbia. If my school were to hold a science fair, I could have MateoConLechuga make a monochrome port of this calc program that could use a MAX32600 demo EV kit board istead of the MSP432. I could then just build the rest and that would be a big hit. I may even suggest to my school to have an annual science fair so that I can show off what a TI84+SE can do. When it comes to linking my calc to the outside world, I have already linked it to a special amplifier-based circuit to make an LED blink. Kerm, just keep on hacking these calculators and we here at cemetech will be very entertained. This must be some sort of super-efficient asm magic! Actually, there is no assembly in this project at all. All the magic is done in BASIC on the calculator or C++ on the launchpad. The whole point of the project is to demonstrate what can be done with just BASIC. Wow! Can it be done on a monochrome calc? Sure, it would probably be trivial to port. One day i may do it! © Copyright 2000-2019 Cemetech & Christopher Mitchell :: Page Execution Time: 0.122676 seconds.